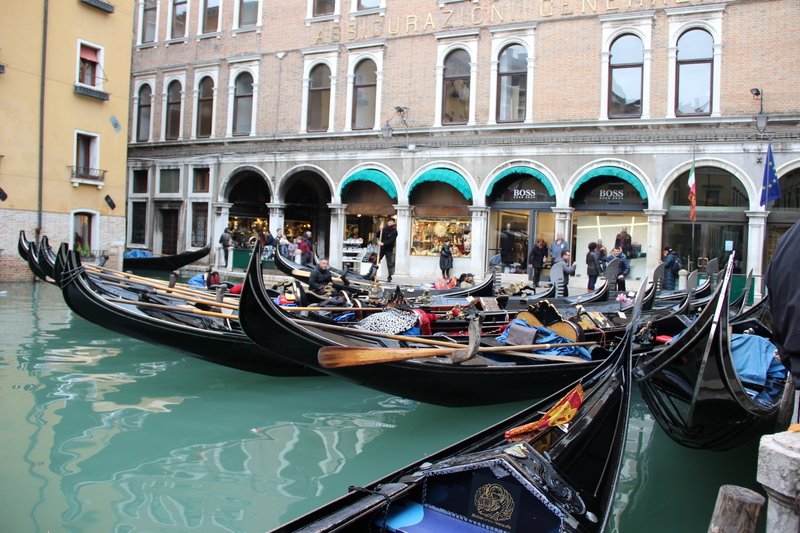 I learned how to identify gondolas (there are also black, banana shaped lagoon boats in Venice). 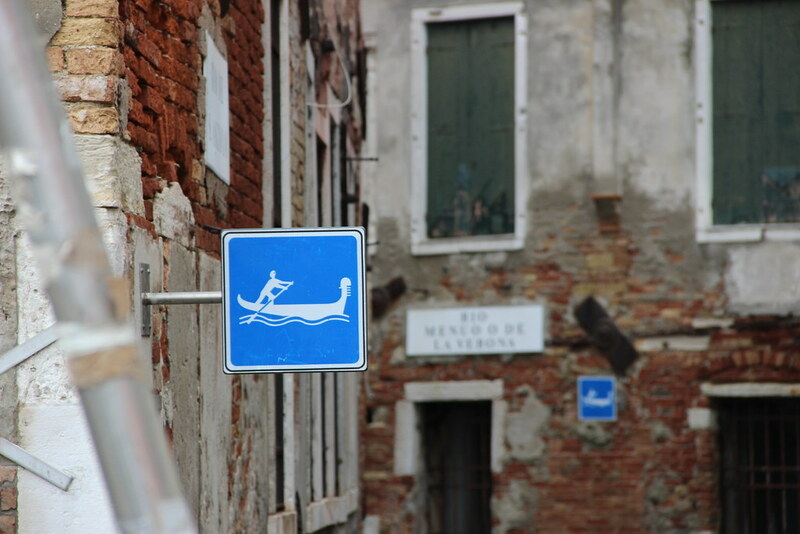 As depicted in this little street sign, gondola’s have a metal piece in the front with six prongs. Each prong represents one of the 6 districts of Venice. I’ll just being with the beginning of my Saturday. I got up early to take some pictures right out side the hotel, before returning to meet up with everyone at the breakfast. 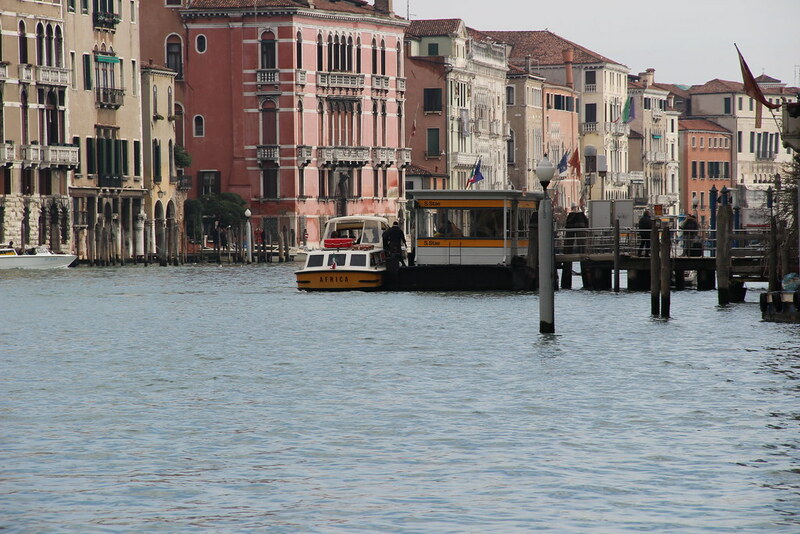 There’s a water bus/vaporetto station right there; Accademia was our stop. We got 48 hour bus passes for this AIFS weekend trip, so I basically got unlimited access to using the water buses! A vaporetto on the canal beneath the bridge right by my hotel. The deeper canals (such as this one, are only about 10 feet deep. I’m just wandering around alone. 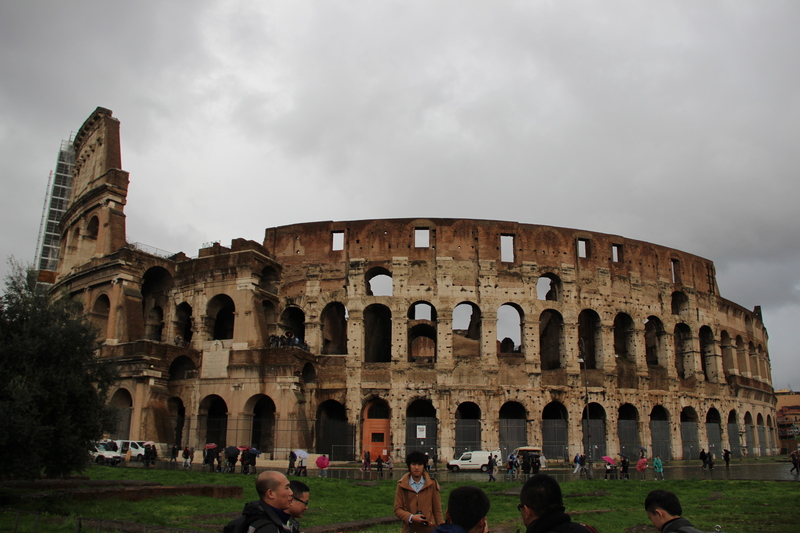 The architecture here is so different than Florence. Imagine having your own bridge to get home. Some random food place I passed. 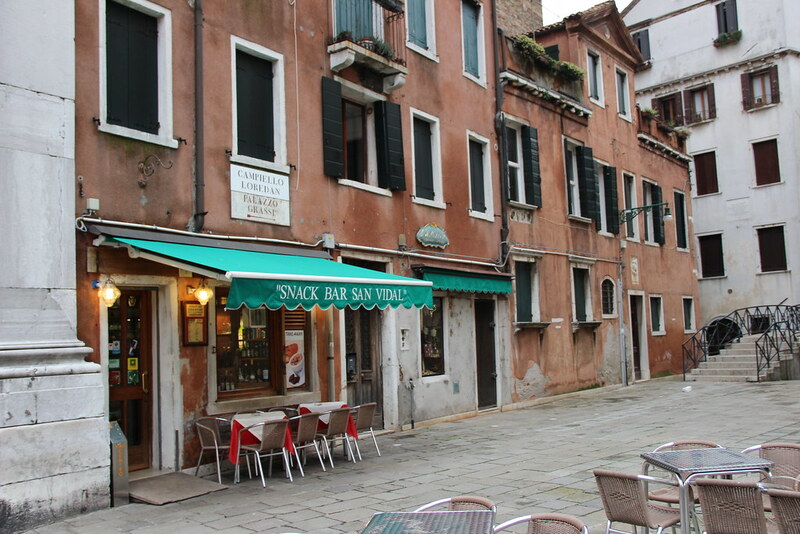 I personally didn’t find the food in Venice very good, but this is just based on the places I wandered into. 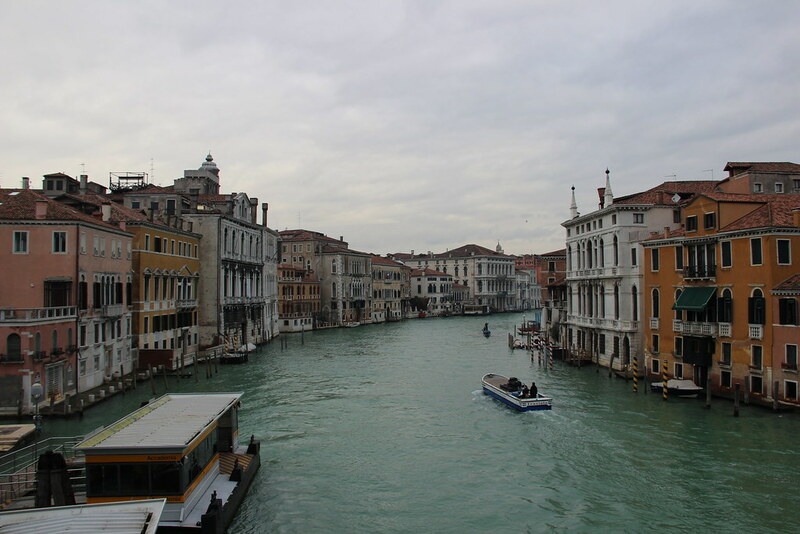 At this point I returned to the hotel where we began our three hour tour of Venice with our Venetian tour guide Rita. 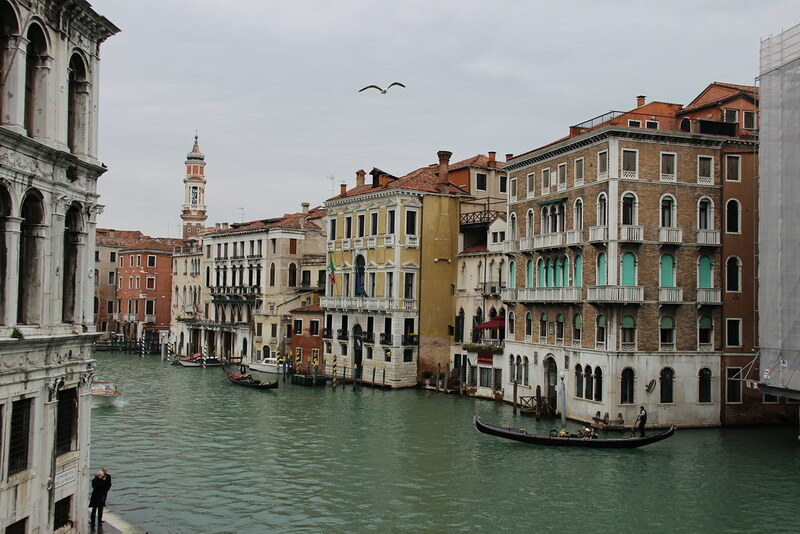 We learned a great deal, like the fact that the city of Venice is indeed sinking. This is due to fact that the city was built on wooden pilings — the foundations of the city are long, wooden tree trunks driven into the marshy ground, which have since petrified due to lack of oxygen. These foundations are slowly sinking. In addition to this, the water levels in Venice are rising. A super cute golden retriever! 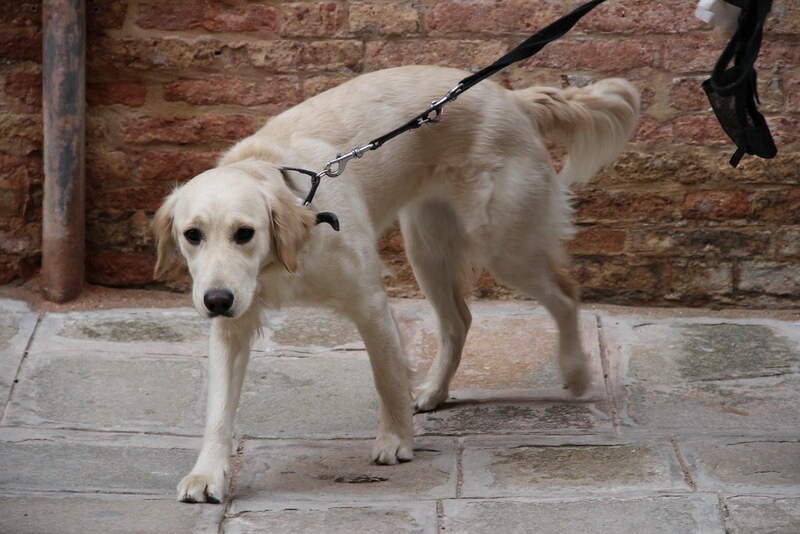 Apparently, Venetians love their dogs. Tourguide Rita told us she scolds any owners don’t pick up after the dogs. 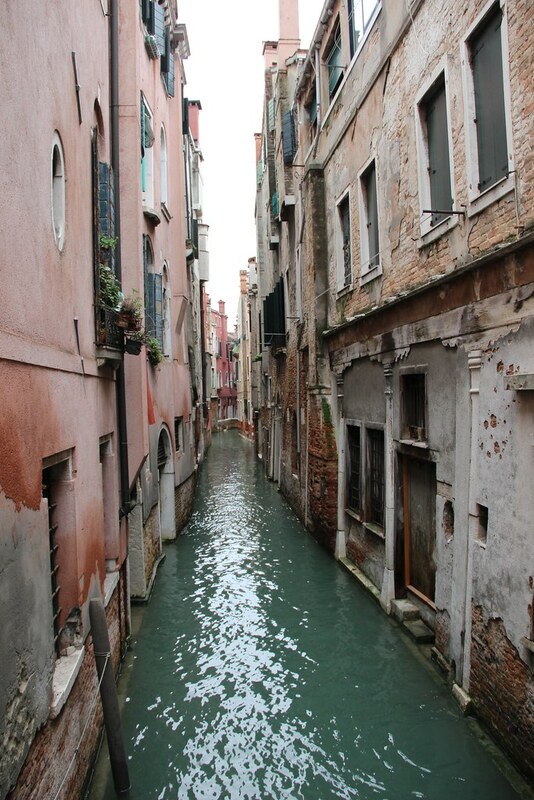 In Venice the water ways look like little streets made of water! These small canals are only about 3 feet deep. Some boats. The water really is this colour, too. 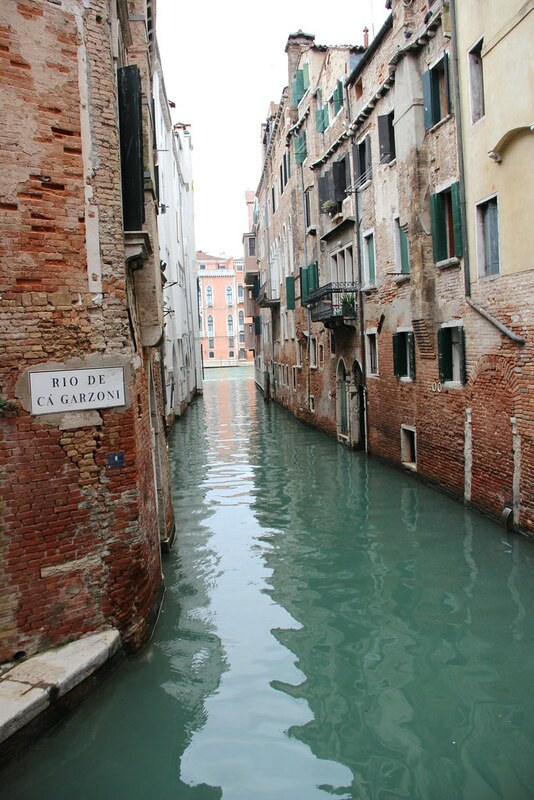 Venice floods often. On days that street cleaners anticipate heavy flooding, they abandon their usual posts of collecting garbage bags and begin setting up these cat walks. 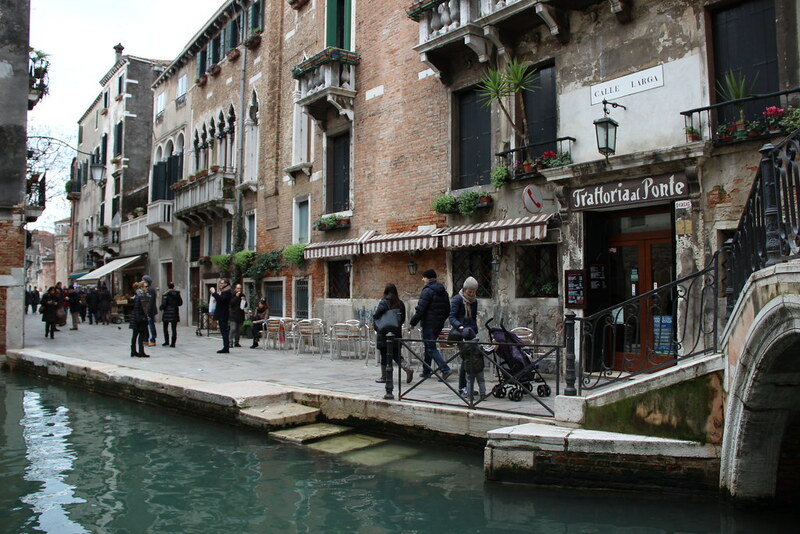 In this way, the Venetians can walk along the streets above the water. Rita told us that it is very difficult to move alone the cat walk with other people on it as well. 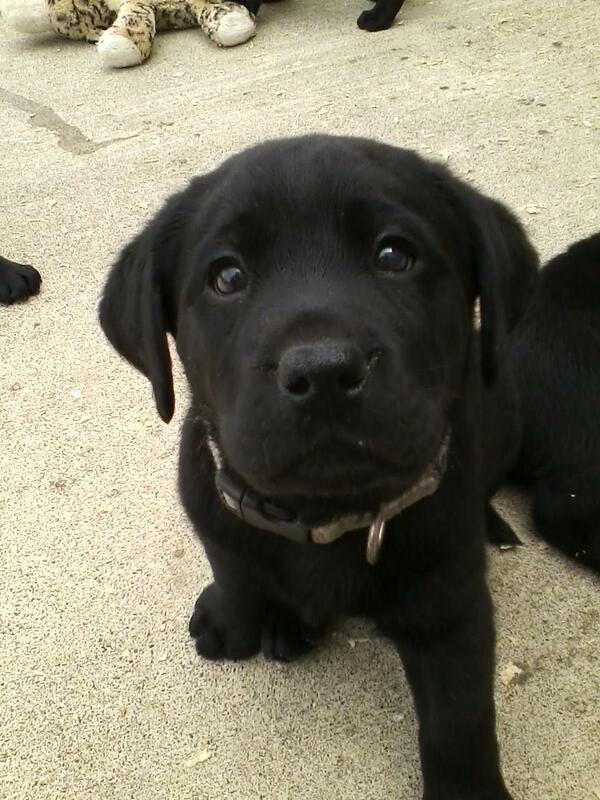 Another dog! You can see the fashionable dark-coat-with-white-scarf combination worn by many of the Italians. 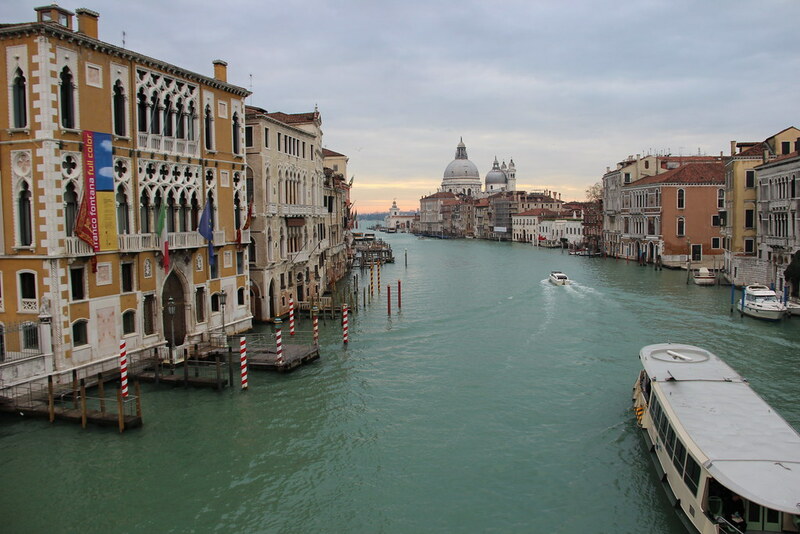 Venice once collected all of its water from rainfall. Their street drains and roofs were designed to catch rain water. 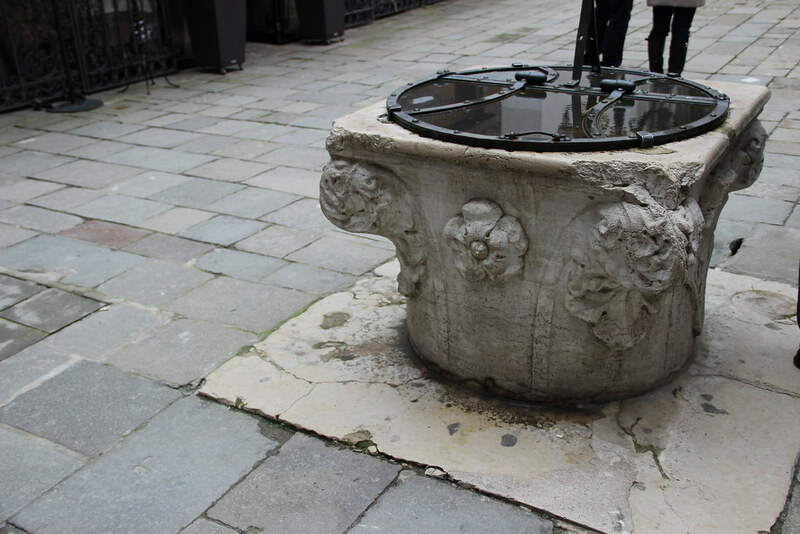 Water that seeped into the street drains fell into a large, ceramic holding container built directly beneath the well (seen here), which separated it from the surrounding salt water. The clean water was accessible to the civilians via wells like this one, which are spread around the city. Guards were once posted by these wells to prevent any water contamination. The water was filtered by a system of sand filtration. Today, fresh water is pumped in from the main land. 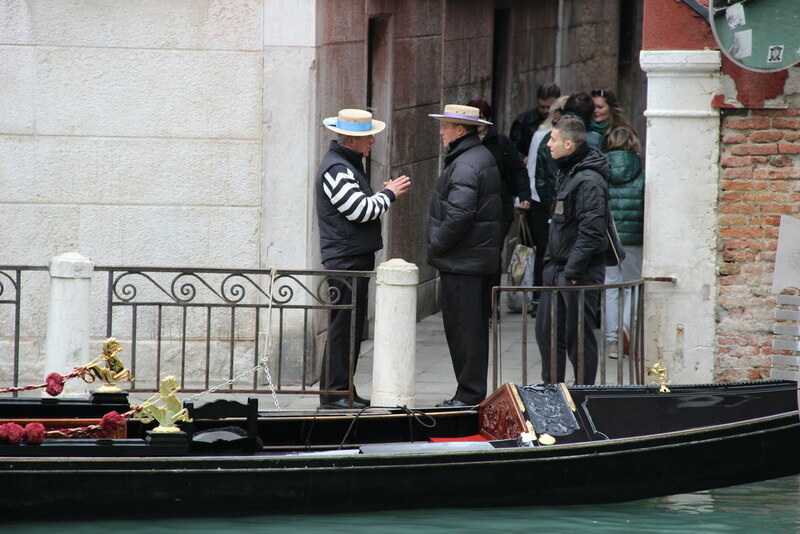 The water level has risen about 2 feet from when the city was built — gondoliers like this one need to compensate for the smaller passages. Interestingly, gondolas are not mass produced. 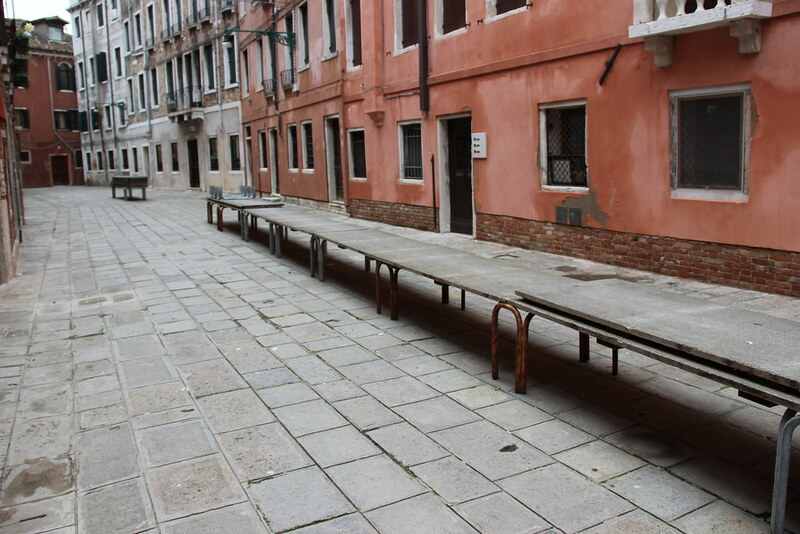 Each gondola’s length and width is customised to the gondoliers height and weight. 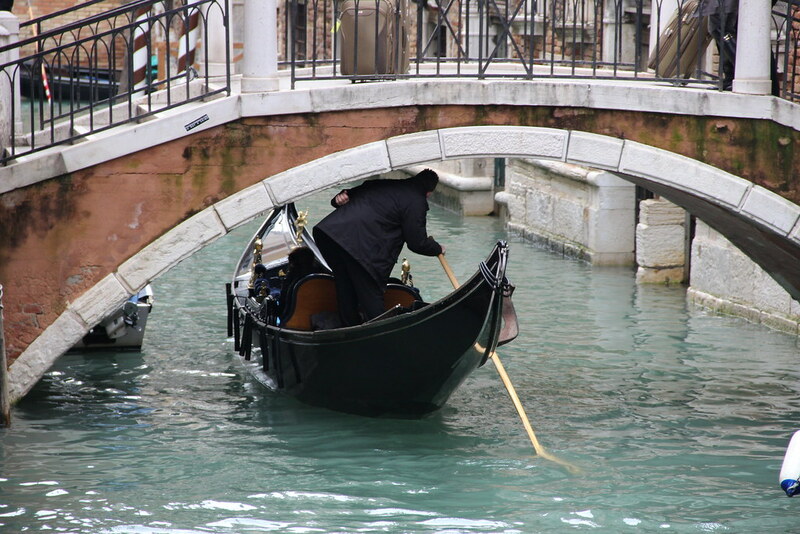 It has to be specific so that the gondolier can handle manoeuvring the boat all on his own. 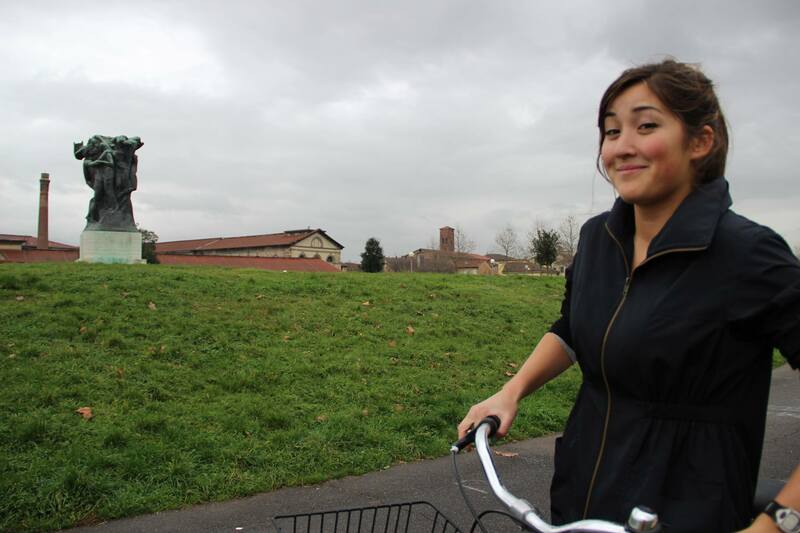 Side note: bicycle riding is tolerated only by children in Venice. Otherwise, it is forbidden. 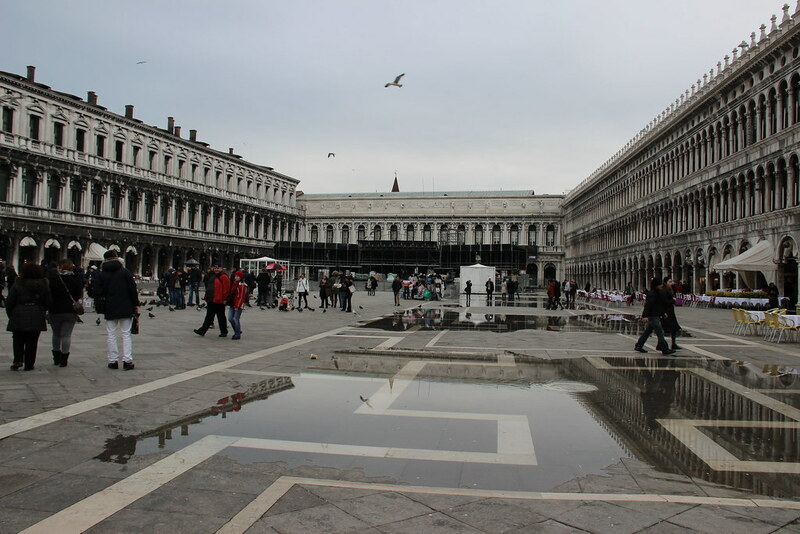 The Piazza San Marco in Venice! The pool of water visible there is not rain water– it is actually salt water that has bubbled up through the storm drains. 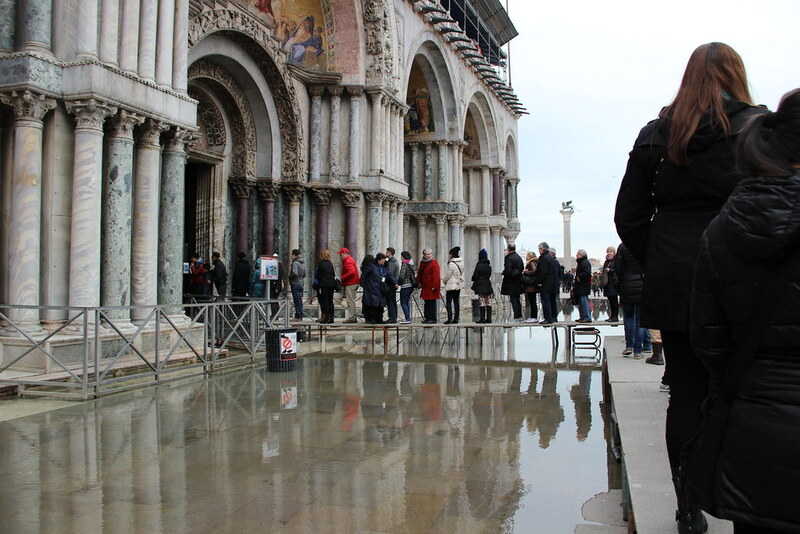 This happens frequently due to the sea level, which (as I already mentioned) is about 2 feet higher than it was when Venice was first built. Salt water ruins leather, so don’t let any of this touch your boots! 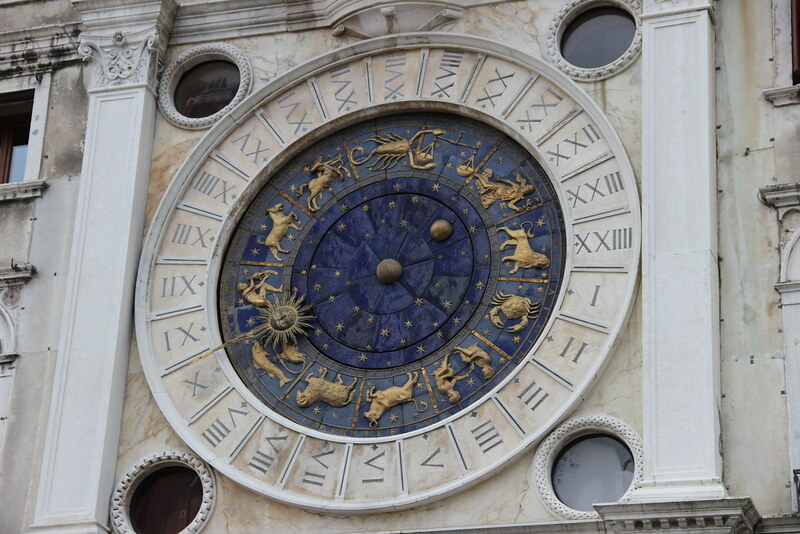 This interesting clock depicts the zodiac. It was also made when it was believed that the Sun circled the Earth. You can see the Earth and moon in the centre of the clock. 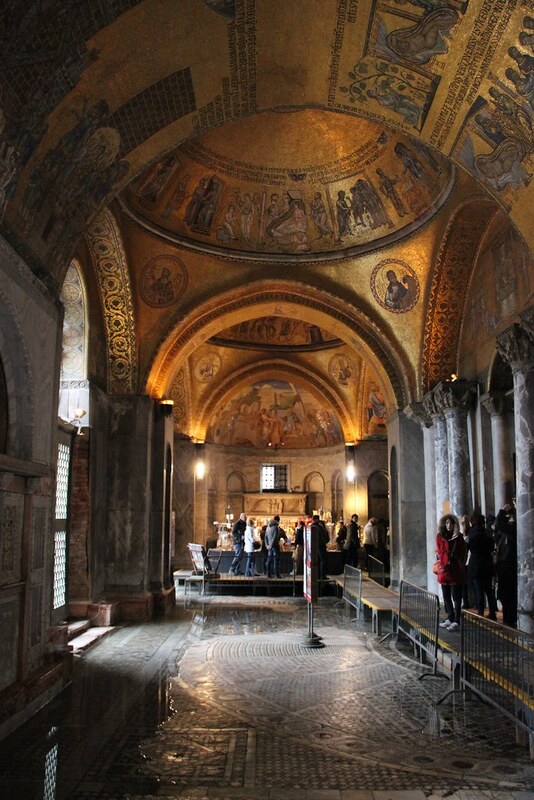 The San Marco church does not allow backpacks inside. Luckily, I hadn’t brought my backpack. I’m not sure there was really a solution to this issue (no coat-check area) other than simply not bringing a backpack. Here the flooding (that reaches into the church) is visible. There is the cat walk in use. First interior shot; the golden ceilings here are famous. Photography is not allowed within the church. Also, the flooding is visible here. A stand with some veggies. More narrow canals. It is impossible to walk along the water line/along the main canals, as there simply is not sidewalk or long stretch of flat area. So our tour meandered through pieces of all the 6 districts of Florence via the back ways and little bridges. We ended our 3 hour tour in the Jewish Ghetto. 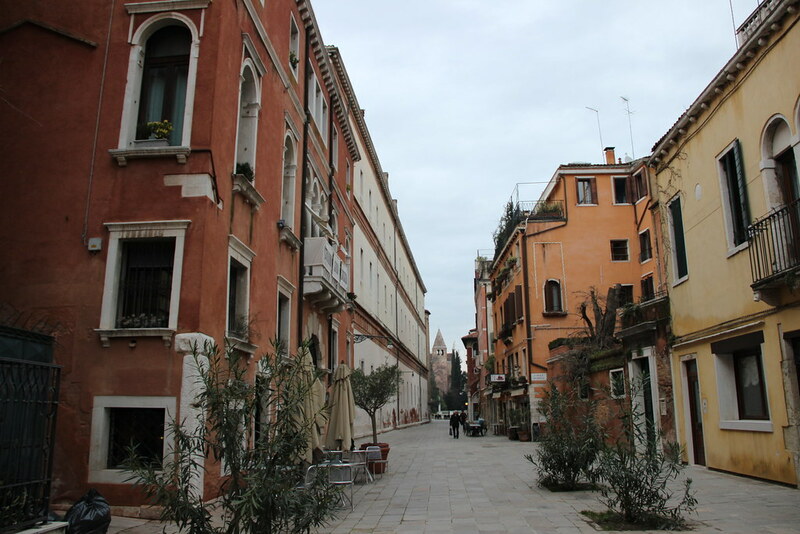 To Italians, the ghetto was the districts that the jewish banking families were allowed to rent apartments, as they were not permitted to buy/own Venetian land.The building on the right is a synagogue (the jews were supposed to be discrete with displaying their places of worship. There are actually 5 synagogues in this square, and a well is visible on the left. Synagogues are easily identified by the 5, round-arched windows which represent the 5 books of the Torah. Afterward, Elizabeth V. and I wandered off as everyone else dispersed to eat lunch. Again, notice that there is no water front. There are occasional strips of side walk, but they do not run along all the canals. 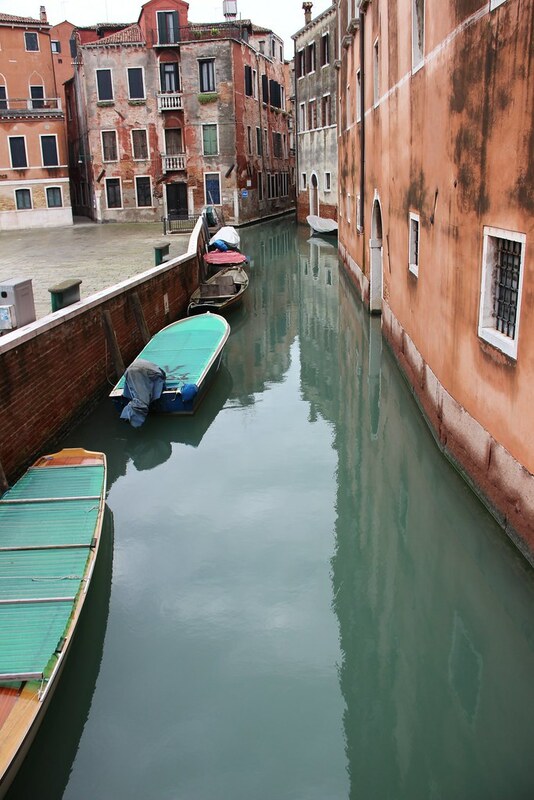 The rising water level is slowly obscuring the many steps that now recede into the green depths of the canals. One of the vaporettos ahead of ours. I was surprised that the water buses meander from one side of the waterway to the next to load and unload passengers. I had assumed there was a system of keeping to one side of the canal, but this doesn’t seem to be so. 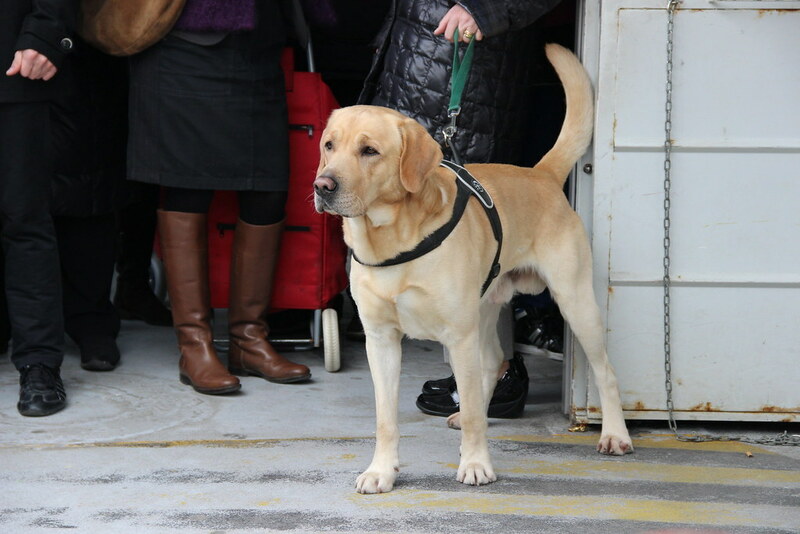 A lab waiting to board the vaporetto. Service dog laws aren’t as developed in Europe as a whole as they are in the U.S., but average pet dogs have more public access than U.S. pet dogs. A view of a gondola and restaurant from the vaporetto. 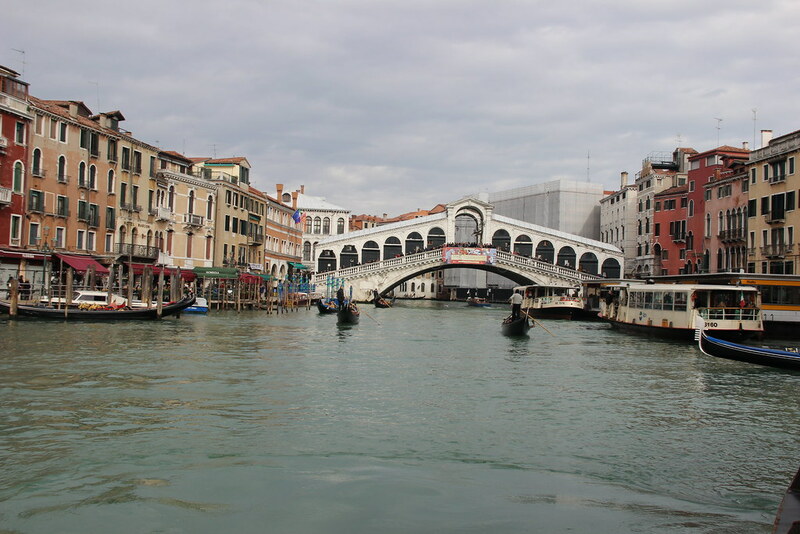 The Rialto bridge. 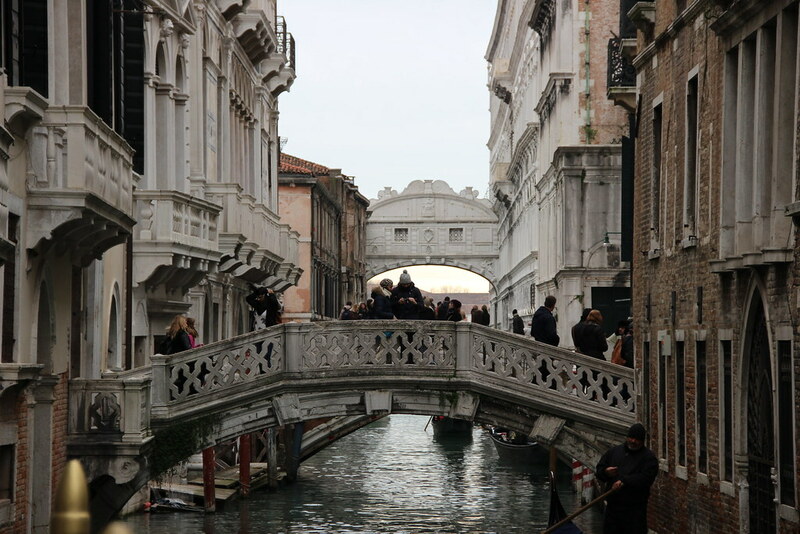 In Venice, whenever you cross a bridge (large like the Rialto or any smaller size) you have technically crossed onto another island. Elizabeth V. (my roommate) and I walked around for a bit after our tour. Interestingly, there is no night life in Venice. 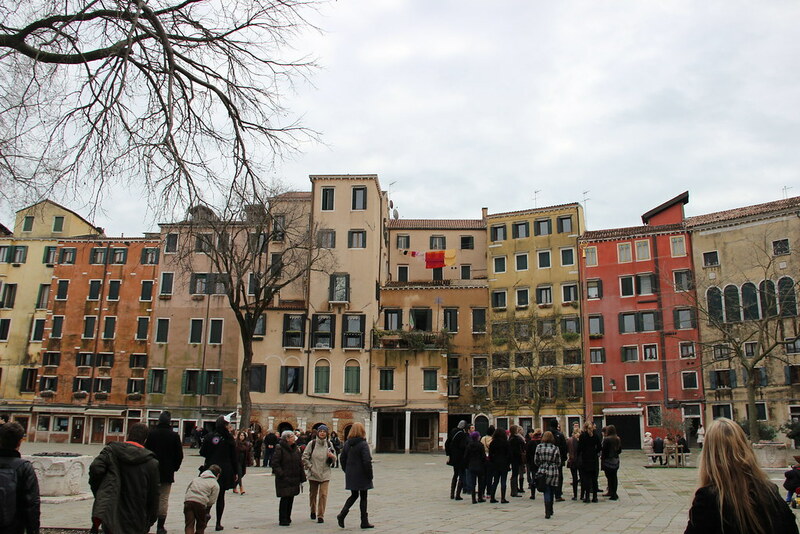 For this reason many young Venetians move away; Venice is slowly losing its young people. This made me a bit sad. 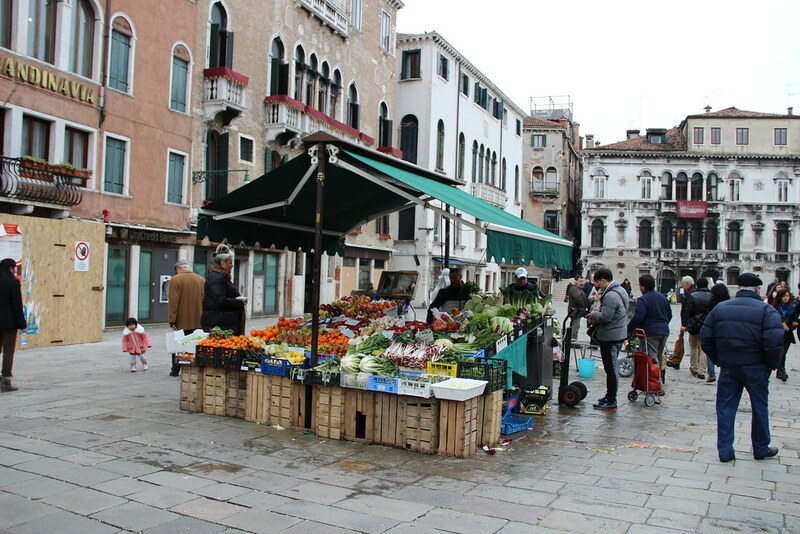 Venice was once the hollywood of Europe, and in comparison today’s Venice is in decline. It is now a quiet city that isn’t being funded for repairs — essentially, it is sinking and thus far nothing seems to be being done to prevent it vanishing into the green waters. Venice also has a very low crime rate. Honestly, my photography is not an accurate representation of Venice. 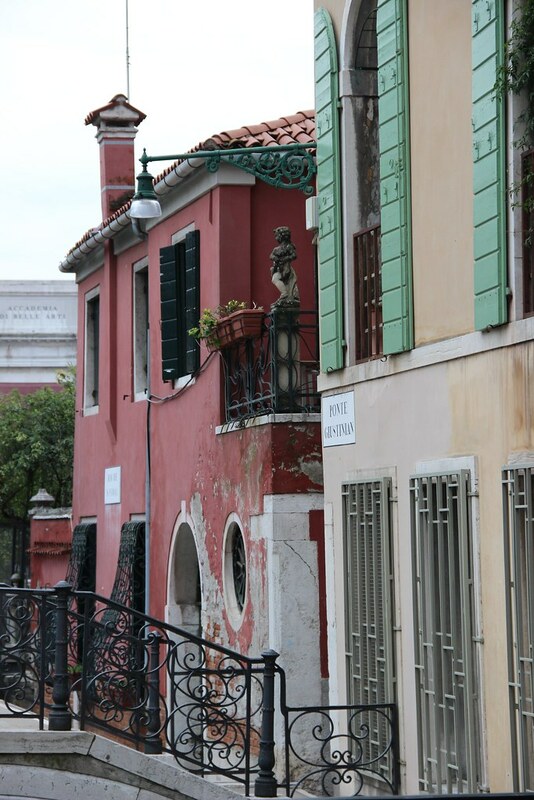 I’m drawn to photograph what I find appealing, so my photos are of the prettiest corners of Venice that I saw. To me, however, these pockets of charm simply dotted unexpected stretches of quiet bleakness. 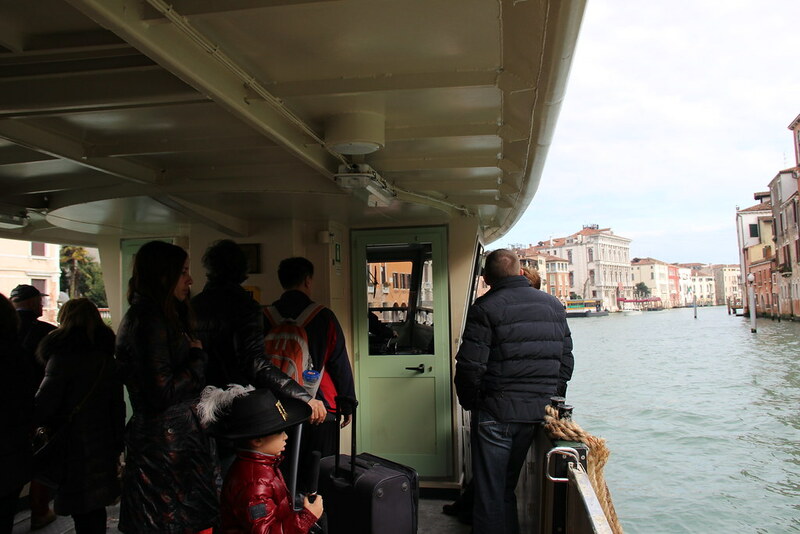 I know that many of my classmates adored Venice; I suppose I simply expected Venice to be a bit “more.” Thus far, one of my favourite things was riding the vaporetto. Look up some places to eat beforehand. A lot of food here is yucky, other students had bad experiences with food. Don’t take a backpack on the walking tour. 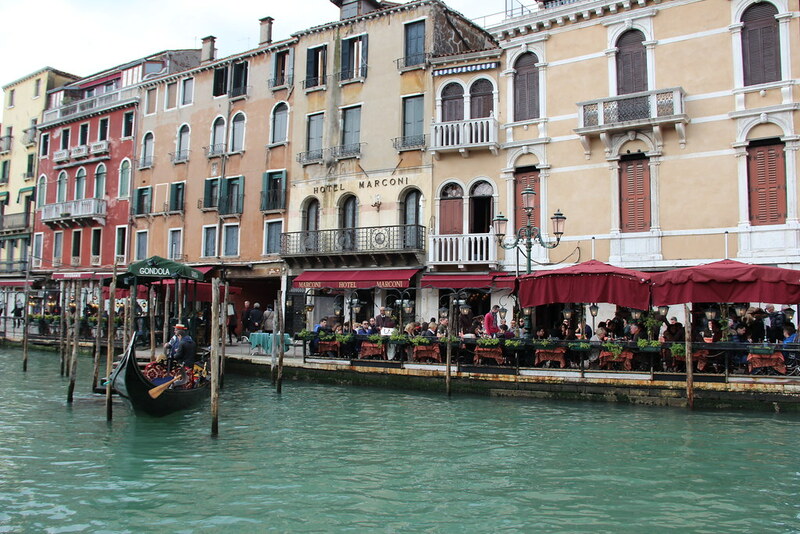 For fun: ride the vaporetto/water bus around just for sights of the city! Venice is a lot smaller than it seems, and it is enjoyable to see the city from the water. Go island hoping!! 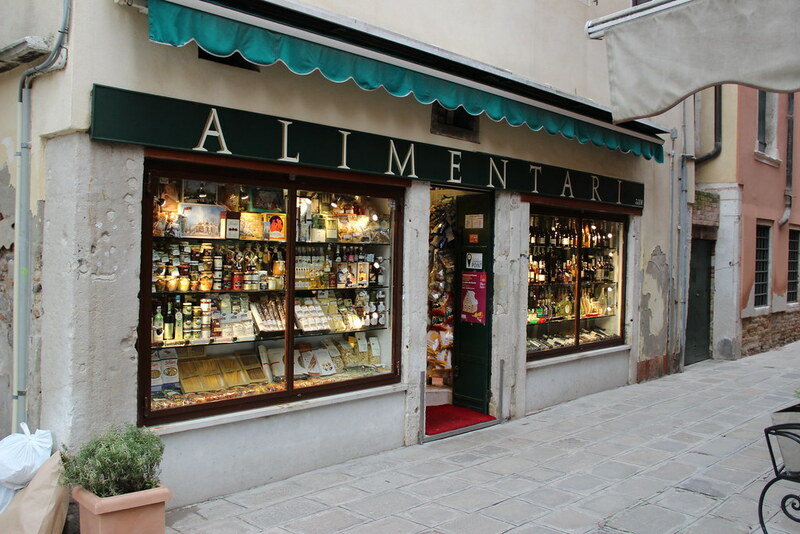 Visit the other little islands like Murano (famous for its glass) and Burano. They are apparently unique and adorable, and not visiting them is the greatest regret of my Venice trip. I got lucky because it didn’t rain the entire weekend I was in Venice. However, bring waterproof things and a warm coat and gloves. There is no night life in Venice, so don’t wait until late in the evening to go have fun.